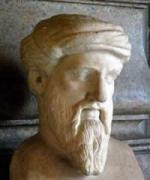 Pythagoras of Samos lived around 500 bc, and was a mathematician, philosopher and religious teacher. He is best known for the mathematical theorem that bears his name. However, it is apparent from megalithic carvings that the relationship between the sides of a right triange were known as early as 2,500 bc. So it seems that Pythagoras did not actually originate the theorem. d is the hypotenuse (i.e. p to q). x is distance along the x axis ( i.e. o to r). y is the distance along the y axis (i.e. o to s). z is the distance along the z axis (i.e. o to q). Further information on the theorem may be found here. 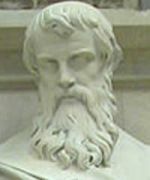 Further information on Pythagoras' life and teachings may be found here. Some time between 300 bc and 200 bc, Euclid of Alexandria collated and unified geometry. Many of Euclid's theorems were originated by earlier mathematicians, but Euclid showed how they formed a comprehensive and logical system. His book "Elements" is one of the most influential texts in history, both for the method and the mathematics. It included both plane and solid geometry. From this the concept of Euclidean space is derived. Further information on Euclidean geometry may be found here. Further information on Euclid's life and works may be found here. In 1632, Galileo Galilei described the concept of relativity in his "Dialogue Concerning the Two Chief World Systems". In it he used an example of a ship travelling at constant speed on a smooth sea. An observer doing experiments below the deck would not be able to tell whether the ship was moving or stationary. Today one can make a similar observation while travelling in an aeroplane cruising at a set altitude. There is no discernable difference between being at rest and moving at a constant velocity. For example, we are oblivious to the fact that the Earth travels at approximately thirty kilometers per second in its orbit around the Sun. This effect is known as Galilean Invariance or Newtonian Relativity. We may sumarise this concept as "all motion is relative". However, in addition to being relative, any effects of the motion are symmetrical in this version of relativity. We will discuss the relevance of that symmetry later. Further information on Galilean Invariance may be found here. 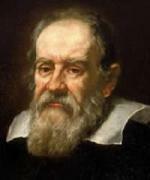 Further information on Galileo's many achievements may be found here. 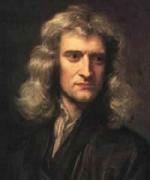 Sir Isaac Newton's work on gravity and the laws of motion became the foundations of classical mechanics. His book Philosophiae Naturalis Principia Mathematica, published in 1687, is considered to be one of the most influential book in the history of science. Although Newton considered space and time to be absolute, the combination of Newton's mechanics and Galileo's concept of relativity "all motion is relative" led to what is known as Newtonian relativity. Newtonian relativity differs from Einstein's relativity in that inertial frames are related by Galilean transformations, rather than Lorentz transformations. This means that all motion is symmetrical between frames of reference, and there is no contraction of physical distances, nor dilation of time. Further information on Newtonian relativity may be found on the Wikipedia page Galilean invariance. Further information on Newton's many contributions to physics, mathematics, astronomy, alchemy and theology may be found here. 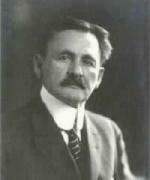 In 1887, Michelson, working with Morley, provided evidence that the aether did not exist. He did this by showing that the speed of around 30 kilometers per second at which the Earth orbits the Sun had no effect on measurements of the speed of light. Michelson used a device known as an interferometer. Coherent light enters the device, and is split into two beams by a half-silvered mirror. These beams of light are then reflected back by ordinary mirrors, and combined again by the half-silvered mirror. The resulting interference pattern is captured by a detector. If there was a light medium, the motion of the Earth would cause a displacement of the interference fringes which, though minute, was measurable. No such displacement occurred. This was the first practical evidence that, in empty space, there is no medium through which light passes. Further information on the Michelson-Morley experiment may be found here. Further information on Michelson's life may be found here. 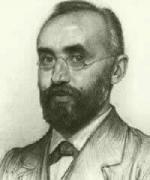 Hendrik Lorentz was a physicist who supported the view that light required the existence of a medium, through which it travelled. In 1892 he sought to explain the results of the Michelson-Morley experiment by suggesting that the effect on the speed of light was being masked by an effect known as the Lorentz contraction. The Lorentz contraction was thought to affect the dimensions of the measuring equipment, due to the motion with respect to the aether. However, Einstein's Special Theory of Relativity made the idea of a light medium redundant. Despite this, the idea of the Lorentz contraction was not abandoned. Indeed it became known as the Lorentz transformation, which applies to the dimensions of spacetime itself. Further information on Lorentz's life and works may be found here. 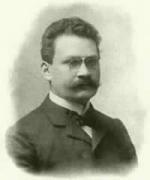 Hermann Minkowski's place in history is assured by the fact that, in 1908, he orignated the concept of spacetime, although the term "spacetime" was not coined until later. Minkowski referred to it as the "postulate of the absolute world". Any point in space and time is a "world point" and the motion of any object could be described as a "world line" in four dimensional spacetime. Minkowski showed that the Lorentz contraction is a direct result of the geometry of spacetime. Minkowski originated the use of spacetime diagrams, which are otherwise known as Minkowski diagrams. 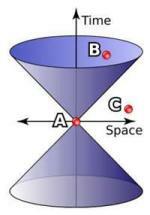 He also originated the terms "front cone" and "back cone" for the areas on a spacetime diagram. If we assume that A is an event in spacetime, time is shown as the vertical (z) axis of the diagram, and space is represented by the horizontal (x and y) axes. I.e. One of the spatial dimensions is suppressed to allow time to be included in the diagram. The front cone (on top) represents future events that can be causally related to event A. So event B, which is inside the front cone, could be caused by event A. Their relationship is said to be "timelike". But event C, which is outside the front cone, could not be caused by event A. Neither could it have caused event A, as it is outside the back cone. This relationship is said to be "spacelike". Further information on light cones may be found here. Further information on Minkowski's life and works may be found here. "The same laws of electrodynamics and optics will be valid for all frames of reference for which the equations of mechanics hold good". "Light is always propagated in empty space with a definite speed c which is independent of the state of motion of the emitting body". This second postulate is not as simple as it may seem, and we discuss it further here. 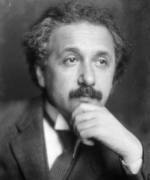 In 1916 Einstein published a definitive paper on the General Theory of Relativity. This drew on his earlier work, but also included the four dimensional spacetime continuum, tensor calculus, and his own work on gravity. This theory was therefore based on a different conceptual framework from the Special Theory. Nowadays, the term "special relativity" often refers to the special case of the General Theory in which the gravitational field is uniform. Hence it is analogous to, but not the same as, Einstein's original theory. Further information on Special Relativity may be found here. Further information on Einstein's life may be found here.